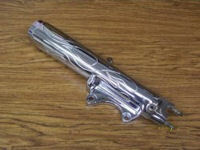 Our specialty is copper, nickel and chrome plating of antique vehicle parts. 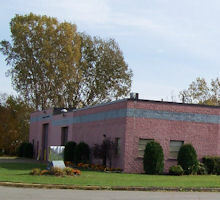 We specialize in difficult pot metal, steel, brass and aluminum repair. 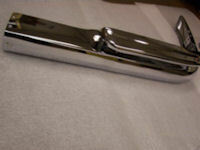 Straightening of stainless steel and aluminum trim is also performed. Our plating tanks will accommodate full length bumpers. Over 200 years of combined experience in the industry results in show quality and satisfied customers every time. Advanced Mold Technologies/Advanced Custom Chrome, INC.. is a state of the art market driven tool and die shop as well as a chrome shop. We design and build injection, thermoset, compression, transfer and shuttle molds, along with diecast and pultrusion dies. In the tool shop we can assist you with your project from part design through production running of your mold. We use outside molders for all molding services. We have created a tight network of outside services that we work with, (trying to beat out import prices) keeping down the cost due to the fast that we all know what to expect from each other. We also build custom parts for cars, motorcycles and your advertising needs. Advanced Mold Technologies/Advanced Custom Chrome, is truly your one stop shop for most anything you may need done in the way of chroming or custom made parts. We can custom build most parts. This is just a small piece we custom made as an advertisement for one of our customers. It started as a rough piece of square metal. 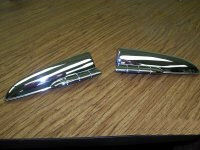 We can duplicate pieces. If you have one and need two, we can help. This is a piece where one was missing and we digitized it and reversed it to build a second piece. We can chrome most anything either a first time or as a re-chrome. 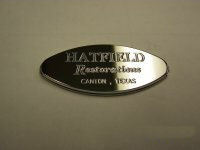 This is a Chevrolet hood emblem we re-chromed. 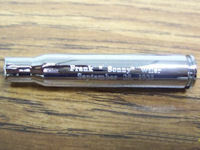 We can take your part and customize it to your specifications most of the time. 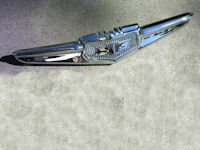 This is the front fork from a Harley. We engraved flames into the shock and chromed it. As with the bumper in this pictures we can often straighten and repair your broken and bent parts including Pot metal in most cases. (See the before and after pictures of this bumper in our gallery). This is a real bullet casing that was used in a 21 gun salute to honor one of our country's veterans. We engraved and chromed the casing. From Advanced Custom Chrome and all the staff, thanks to all our vets everywhere.